Casumo casino has a distinctively colourful and user-friendly interface. With the primary mission of making players smile, this online casino stands out for its playful logo, super attractive jackpots and a must-have welcome deposit. Casumo is an online casino with a distinctively colourful and user-friendly interface. With the primary mission of making players smile, Casumo casino stands out for its playful logo, super attractive jackpots and a must-have welcome deposit. Having been in the game since 2012, Casumo is continually growing in the hearts of many casino players. Casumo casino has won several gaming industry awards. The Rising Star award 2013 and the Innovation in Casino and Mobile Casino Product of the Year award 2017 are just some of the awards. 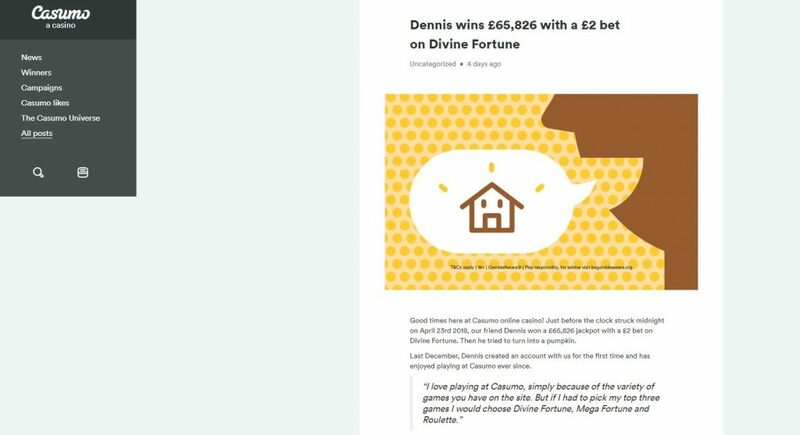 Discover everything about Casumo here, from their welcome offer to the bounty of jackpots, bonuses and their vast game selection. • The casino is owned and run by Casumo Services Limited Casinos. • Casumo is licensed and regulated by the UK Gambling Commission (UKGC), Alderney Gambling Commission, Malta Gaming Authority (MGA). • Uses software by NetEnt, Quickspin, Play N’ Go, Green Tube, NextGen Gaming, Elk Studios, IGT, Microgaming, WMS, Elk Studios, Evolution Gaming, NYX and Thuderkick. • Supports iPad, iPhone, Mac and Android. • Restricted countries include France, United States, Hong Kong, Guadeloupe, China, Martinique and Reunion. Without a doubt, Casumo is dedicated to please both new and existing players with their handsome bonus for new players. 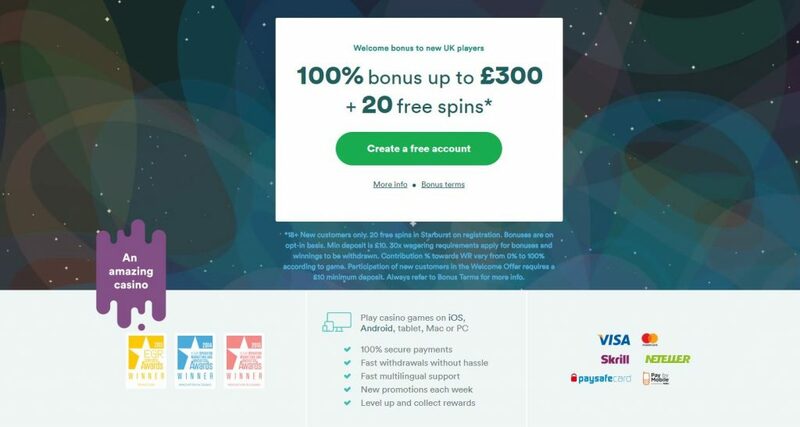 Deposit and get 100 % up to 300 £, you will also get 20 free spins which you can use on Starburst. Every player has a personal Adventure section where they store all their valuables and trophies. Players use trophies to get more rounds of their favourite casino game. Tournament enthusiasts will definitely enjoy the various Casumo challenges and races offered here. Tournaments are usually listed at the bottom of the home page. There is also a wide variety of Jackpots. Whether you are slot lovers or you prefer casino games, it’s rare that you will miss the right jackpot for you. Since the jackpots run independently, it is possible to participate and win in one jackpot and still win in another. Take part in one of the daily reel races and stand to win hundreds of prizes plus a lucrative cash bonus. Reel races run every 30 minutes, daily and players receive their awards at 20:00 CET. Just like other casinos, Casumo bonuses are also bound by rules and policies. For instance, you must meet a 30x wager before withdrawing the welcome bonus and its winnings. If you create an account and deposit £40, you will receive extra £40 to play with. In this case, you have to make 30 times the total amount that you receive in your account. So it will be 30 (40+40). Failure to meet the wager and withdraw before the promotion expiry date leads to bonus nullification. 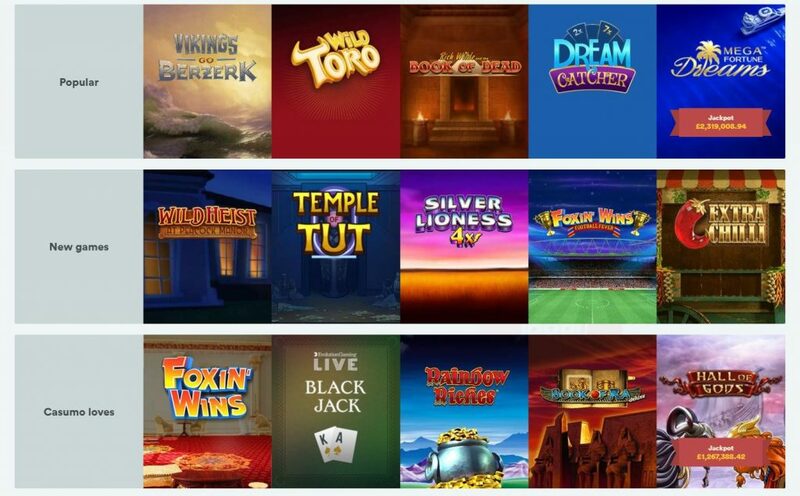 Casumo casino might not have games that are only unique to their site but with more than 10 game providers, the game’s variety remains exciting and thrilling. Casumo casino has one of the largest collection of games in the industry, with over 860 games you can choose from. As expected, slots make up the biggest percentage of games at Casumo. Enjoy the wide pool of colourful, bright, vibrant and well-paying slots available at Casumo. From classic slots like Mega Moolah to more recent slot games like Michael Jackson and Guns N’ Roses. Of these slots, 30 of them come with progressive jackpots that increase every time a game is played but lost. Almost all table games at Casumo can be played for free, giving you an opportunity for exploring and sharpening you casino strategies. Some of the most popular table games featured at Casumo are Roulette, Blackjack, and Baccarat. Casumo also a significant number of offers video poker and Live Dealer games. Casumo is quite an appealing casino. It does not have as much glitter, twinkling lights or extremely advanced graphics on their user interface, as many online casinos. Instead, this online gambling platform uses simple colours and a logo of a short sumo warrior in a red lower-mawashi (belt worn by sumo warriors), standing on his one hand, next to a rainbow. You will find most options ready, on their fast-loading Frontpage. Players will find the Login and register options on the top-right side of the screen. The links are orange and yellow, right below is a red shortcut to the games’ library. Usually with online platforms, the easier it is to create an account, the more people will join. Casumo seems to have recognised that, with their quick-full and short registration form. Whether you want to view the games in no particular order or in categories, the Frontpage is well and specially designed so that players can clearly see the links. On the left of the screen is a slider that displays all activity at the casino. It is almost like Facebook, just that you do not get a chance to type and edit your activity. The activity also shows peoples’ wins, as well as the game that they have played to win. Players can opt out of being listed from their account settings. If you wish to change the site’s language, scroll to the bottom, just below the Reel races banner. Other policies, Casumo’s social media links and terms and conditions are also found in the footer. While it is okay to expect Casumo to extend its diversification in payment methods, that is not the case. The online casino has decided to keep things simple with a short list of banking options on offer. The smallest deposit allowed is £10. However, you can only withdraw a maximum of £5,000. Since the wagering requirements are a bit steep, new players are advised to be careful when depositing the initial deposit, especially if they will accept the bonus. Visa, MasterCard and e-wallets are the most popular methods of payment here. Neteller, Instadebit, Paysafe Card and Skrill are the only allowed e-payment methods accepted at Casumo. Bank transfer is also available, although it may take a few days before the money can reflect in your Casumo real-money account. Judging from verified customer reviews, Casumo casino’s withdrawals are fast and dependable. The online sire takes pride in a 23-hour withdrawal processing duration. Therefore, you can expect to receive your wins 1-3 business days after you have requested the payout. Note that first-timers must provide verification documents before their payment can be fully processed. Casumo support will need a photo of your identification card or passport and proof of residence. Your withdrawal request might fail if you accepted a bonus that is yet to meet the wagering requirement or expired. To conclude, Casumo has been in the industry for half a decade now and has created a good name for itself. The casino operator has won many awards, holds three trustworthy gambling licenses, features hundreds of games and offers games from 10 of the best gaming companies in the industry. Also, players are warmly received since day one, with hefty bonuses and exciting jackpots. The customer support is fast, always available and friendly. Therefore, Casumo Casino is a brilliant choice if you are searching for a reputable and secure online casino. There are also affiliate opportunities for those who wish to make a few extra coins from casino marketing.